Description: Amtrak P42DC #90 sits idling at San Jose Diridon Station as she prepares to shove eastbound Capital Corridor train #744 to Sacramento. Description: PO 97 South Bound Pineloch Yard running with three units. 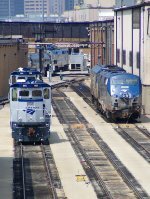 Title: AMTK 90 Heads up Amtrak #5 out of galesburg IL. Description: on time and flying Wb toward Burlington Iowa. Description: Amtrak #48 the eastbound Lake Shore Limited. Description: Fourteen cars with two baggage cars made for a very impressive P448, Lake Shore LTD. Title: AMTK 42 "Salute Our Veterans" on Amtrak 48 "Lake Shore Limited"
Description: AMTK 42 "Salute Our Veterans" leads the Lake Shore Limited. Description: My third shot of AMTK 42 leading the Lake Shore Limited. Title: AMTK 90 on Amtrak 48 "Lake Shore Limited"
Description: AMTK 90 trails as the second unit on Amtrak 48 "Lake Shore Limited." Description: Amtrak #90 sits on Train 681's equipment as it lays over just west of Union Street in Brunswick - before going out later in the evening as Train 688. Description: AMTK #90 holds the main while MERR 488 passes on the controlled siding in Brunswick Maine - evening of 10/11/2013. 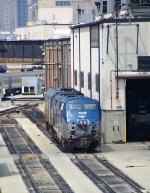 Description: Amtrak facility in downtown Chicago IL. Description: The eastbound Chief arrives on time. Description: After a station stop long enough to build up a little carbon, the journey resumes.